Eruviel stood silently, watching their surroundings and the road from the darkness behind a tree further into the woods. She frowned, looking to the house before she started to turn and peer into the night behind them. Eirikr followed her gaze. “Do you hear something? What is it?” His anticipation stretched his nerves as the minutes tick by so slowly. Eirikr shot her a grateful look. Suddenly, a woman’s cry and a crash came from the house. Eirikr, without a moment’s hesitation, sprinted for the door, his cloak billowing out behind him like a ghost. “Ninim!” he called. Eruviel whirled around to pursue him, looking wildly about as if expecting to be ambushed. Eirikr threw his shoulder into the door heedless of anything beyond. The light from the interior spilled across the lawn as he practically fell inside as the door gave way. Eruviel followed, drawing her dagger as she ran up the steps. An arrow flew past her, slamming into the rough planking of the cottage. She nearly ran into Eirikr as he stopped half in-half out of the house. Sten stood facing away from them as Ninim cowered on the floor with her back to them all. At the noise, he whirled and drew his dagger from its sheath at his side and held it up defensively. Eruviel quickly assessed the situation as she pulled out her bow and an arrow. Shooting Sten a dark glare, she looked back out in the direction the first had flown from. Sten moved to stand directly between Eirikr and Ninim. The woman peeked around, wide-eyed, and stared at her husband. “Eirikr?” she said as if she could not believe her eyes. Outside, another arrow flew toward Eruviel’s silhouetted form. The Elf grabbed the door, wrenching it over, using it as a shield. As soon as the thwap sounded she reemerged and loosed one arrow then another in the direction of the attacker. Sten waved the dagger in front of him, as if taunting Eirikr. “Why don’t ye show ‘im the surprise, Ninny.” He stepped back to grab Ninim by the hair and drug her backward. With a cry, she fell to her backside and clutched her enormous stomach. Behind him, Eruviel’s mouth curved in a smirk at the distant cry only to be jolted by Eirikr’s. Turning to look back, her smirk vanished and the air deflated from her lungs as she saw Ninim. Sten laughed loudly as he crouched beside Ninim. He held her back against his chest and purred, “Ninny Nin look a li’l different than ye last saw ‘er? Awe, come on, boy. Come give yer wife a kiss.” His eyes on Eirikr, he licked the side of her face as she cringed but did not pull away. From the darkness outside emerged two men, one bleeding steadily from his arm and dragging a sword through the dirt. The other ordered the man to the left as he moved to the right; he too bore a weapon: a club as thick as a troll’s left leg. Eruviel’s knuckles turned white as she gripped her bow. Seeing the two men out of the corner of her eye, her eyes turned a shade darker. “Do you have things here, gwador?” she asked in a chilling tone. Eruviel looked back at him, hesitating as she leaned her bow against the outer wall. “Right. I won’t be long,” she said quietly. Drawing her sword, her thumb played over the black string wrapped around the hilt as she descended half-way down the steps. The men approached warily, prepared to lunge if an arrow came their way. They grinned as she set down her bow. As they approached the half-way mark to the door, Club gave a shout and both charged, Swordarm’s battle cry slightly less enthusiastic than Club’s. Eruviel pulled out her long dagger with her off-hand, waiting, ready as they charged at her. Club dodged in first and whipped his weapon toward the side of her head. In an attempt to flank her, Swordarm continued around her left side. Eruviel dropped under the club as it flew across where her head had been and sliced out with her sword at Clubs legs; her eyes flicked over to the second man. The force of his swing carried the attacker in a half circle as he pivots on his foot. He let the momentum carry him around to raise the club in a swift upswing. Meanwhile, Swordarm raised his sword with both hands as the blood ran down the dirty fabric of his shirt. He left himself exposed as he slashed down. Eruviel jumped away from Club, lunging at Swordarm. Raising her dagger to block his weapon, she thrust her swords towards his chest. Swordarm grunted as the blades penetrated his flesh. He raised his blade with one hand in a feeble attempt to thrust at her side. Meanwhile, Club wheeled back to watch his comrade fall, disbelief on his ugly features. Eruviel left the sword in him and grabbed his raised arm as they fell into the yard, her hand holding the dagger and ready to stab him once they landed. Eirikr stepped forward as he started to draw his weapon, his eyes cold. As Sten focused on taunting Eirikr, Ninim’s hand reached for a jagged piece of the earthenware scattered across the floor. Her fingers strained as she tried not to pull away revealing her purpose. The man grunted and pulled Ninim tight again. “‘E paid me well enough. Plus, I got to feast on some nice, succulent flesh every night.” As he leaned over to lick Ninim again, the movement was enough to let Ninim get a grasp on the scrap. She brought it up quickly and jammed it in his face. With a pained, ferocious growl, Sten released her and clutched at his nose. Ninim scrambled away beneath the table as quickly as her belly would allow. Fuming, Eirikr hesitated just long enough to see Ninim escape to safety before turning on Sten. He lunged forward in an attempt to stab Sten in the stomach, but the delay allowed the man to regain his senses enough to raise the dagger toward Eirikr. Sten lowered the hand covering his face – an eye was badly damaged and his nose clearly broken and bleeding inside and out. Sten parried the sword with his dagger, directing it toward the wall. As he turns away, he slashed up catching Eirikr across the cheek. Outside as Swordarm landed in the grass, a cloud of dust billowed up around him. Club took the chance to charge forward to slam the club down into the back of Eruviel’s skull. Eruviel rolled off of Swordarm, taking her sword with her. The club rushed down at her and grazed her cheek as she flung herself to the side. Crying out, she leapt to her feet and retreated back to the path through the yard. Club recovered from slamming the weapon into the ground. He turned to Eruviel, cracking his neck with a jerk. “Pre’ty li’l Elf. Come play with me, She-Elf.” He raised his fist and motioned her forward with the club raised in the other hand. Grinning, Club leapt toward her without grace. He swung the club toward her aiming for her head. She jumped back, dancing around him to find a more advantageous opening as her eyes flicked for a moment to the house. Club placed both hands on the club and licked his lips in anticipation. Soon, he grunted as he began to tire. His swings were slower but still bore much brute strength behind them. Finally, he feinted to Eruviel’s off-hand side. Eruviel dodged, thrusting her sword to his open side, not bothering to check to see if she struck him before prancing back out of range. The brute bellowed in pain. He clutched the wound for a moment before charging recklessly. Eruviel spun to the side as he drew near, dropping low to slash at his leg with her dagger. He crumpled toward his injured leg and she planted her feet, slashing at the man’s hand still clutching the club. It dropped and he howled like a wounded animal, throwing a beefy fist toward Eruviel. She stepped easily outside his punch and swiftly came up beside him to slash her sword under his raised arm. The man fell to his side and howled again in pain. He glared up at Eruviel with hatred. “Filthy Elf,” he spat out as he groped for his weapon. Eruviel jumped at him, her sword aimed at his side and dagger ready to block. “Oh, no you don’t,” she growled. At his side, the man grasped the end of the club and pulled it to him to get a better grip. She shifted her footing at the last second, stomping down on his armed hand with one foot and slamming the hilt of her sword into the side of his face. He groaned and reached feebly but his hands found nothing. Eruviel did not hesitate as she swung her dagger up, towards the side to the man’s neck. Sten sneered as he attacked vicously. “Coward, ye are. Never could follow through.” The tip of the sword sliced through Eirikr’s sleeve drawing blood. The downed man laughed and then coughed up more blood. He fell forward to his hands and knees, blood dripping to the cold stone floor. “He would. And does. They promise him stature and wealth after they conquer this little shithole and Dale.” He laughed again even as it caused the blood to gush out faster. Eirikr stepped up to Sten, sword raised. “Take your filth to the grave, worm.” He started to lower it when Ninim shouted from under the table, “Eiri, no!” Surprised, he froze and looked back at her. Sten took the opportunity to hurl a knife hidden in his sleeve at him. It sank into his thigh and he let out a cry of surprise and rage. As he struck out, Sten knocked his sword away and launched himself at him with his remaining energy. Without thinking, Eirikr reached back to grab an arrow; as he brought it forward, Sten impaled his neck on the barbed point with a gurgle of shock. As Sten sank forward, Eirikr stumbled back and let the body fall. Each beat pumped more blood from the wound in Sten’s neck and chest. As the man’s life ebbed away, Eirikr turned to comfort his wife. Ninim crawled to the edge of the table but looked toward the door. “The Elf,” she said in a worried tone. Following her gaze, he nodded and rushed to the doorway as quickly as the knife in his leg allowed. Behind him, Sten exhaled his last breath, his glossy eyes staring at Ninim as she sat beneath the table, swollen with child. 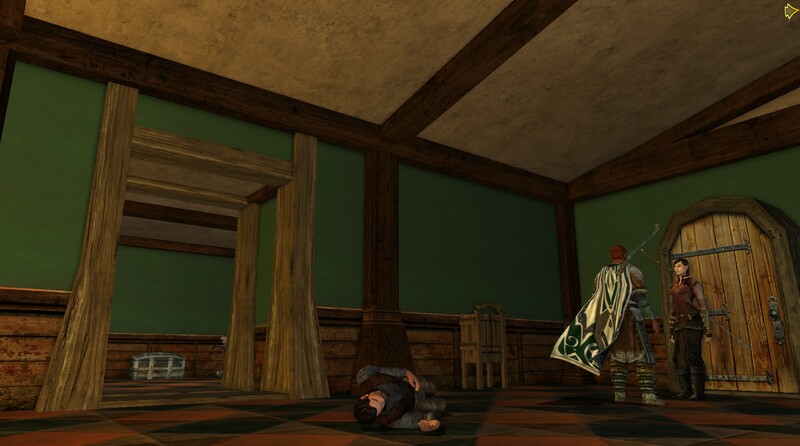 Eirikr watched from the doorway as Eruviel stabbed the brute. From the outside, his expression was indiscernible as he is back-lit by the firelight. Inside, Ninim stared at the blood pooling behind him and when he pulled the knife from his thigh, she finally started to sob. Eruviel quickly landed a second strike to make sure he’s was dead before she stood, her chest heaving from exertion, and kicked the body over. “You feast of wolves,” she muttered in Sindarin, wiping the blood off on his shirt before looking up to the house and Eirikr. Eruviel looked down with a cold expression at Sten’s body, nodding more to herself in assurance as she saw the arrow in his neck. Glancing over to the reunited couple she began to search the cupboards for a clean sheet. Eruviel walked over and knelt next to him. “Hold the end down,” she instructed as she began to bind Eirikr’s leg. Eruviel smiled kindly to Ninim, nodding as she wrapped up the wound. She assessed the woman and her bulging belly, checking for any injury. Ninim’s eyes widened. “You found your sister? That is what he wanted? Where?” Her cheek was bruised from where Sten struck her, but other than that she seemed healthy, if tired and stressed. Eruviel tied of the bandage and stood, leaving the linens behind with a look at Eirikr’s arm. “I am going to bring the bodies inside while you two work things out,” she said with a concerned glance out the window. Eruviel nodded with approval, offering Ninim an apologetic smile before stepping back out into the night. Eruviel grunted with effort as she dragged the larger body through the door. “By the Valar,” she grumbled, letting the corpse fall a short ways further in past Sten’s. Eruviel ‘s step faltered as she walked back to the door. Glancing over at Ninim, then Eirikr, she continued on to retrieve the club and the smaller man. Eirikr nodded as Ninim came bustling out of the room. She hurried to the kitchen and packed some cookware and mess supplies. Once she was ready, Eirikr packed the wagon under the cover of night and watched as Eruviel drove away. A light from the window illuminated the sparse lawn in front of the Tenorbekk cottage. It stood at the end of a dirt lane on the edge of the town where houses sprung up on the banks near the forest. Eirikr stood in the shadow of a large oak tree across the road and watched the front door for an hour before a man emerged and shouted something back inside before slamming the door shut. As he walked down the path to the road leading to the town, he whistled out of tune. Eirikr ducked back behind the tree; he did not have to look to see the man would have been handsome except that his features were sharp and cruel. He knew them well; any time his father needed something “taken care of,” Sten showed up in the parlour in his dirty shoes and cap. The first time he saw him, the man was barely a man: he was a lad of seventeen who already had an air about him that gave six-year-old Eirikr an uneasy feeling. When his cold blue eyes settled on the boy, his grin caused Eirikr’s heart to skip a beat from fear. Kolrson Tenorbekk gave Sten orders to guard a particularly large sum of money being used as bait to trap a shopkeeper that had been skimming profits. “You will go unnoticed and then strike if necessary,” Kolrson had said. His father had not blinked an eye when Sten reported the shopkeeper had stumbled into his knife and was dead. At the end of the road, a man joined Sten and they laughed loudly as they clapped each other on the back. As they disappeared around the corner, their raucous conversation echoed through the fading evening. Eirikr bet that they were heading down to the pub when he looked around the tree toward his home. Every fiber of his being wanted to go inside and embrace Ninim. He could hardly breathe he craved her touch so much; instead, he turned and followed after Sten relying on the man’s voice to lead the way. He managed to trail Sten and his buddy to a seedy tavern near the northern docks. He waited outside for half an hour before deciding he should not keep Eruviel waiting any longer. With his gaze still on the door of the tavern, he started to turn and head down the alley. A boy half his age went tumbling to the boards of the road. “Hari! What are you doing here?” Eirikr reached down and hoisted the boy to his feet as he pushed back his hood. Hari ducked his head and mumbled something Eirikr couldn’t quite catch. Eirikr knelt to level his eyes with his. Hari repeated his words but kept his eyes on the ground at their feet. “Ma told me to watch fer ye. She dinna think ye were dead like that man said.” Hari lived two houses down from him and Ninim. His father Harek often hunted with Eirikr and his mother made the best venison sausage in Esgaroth. Ninim loved to learn from the other woman and they often spent many hours cooking together. “Your mother told you to watch for me? Tell me what you know, Hari.” Eirikr spoke in a whisper with his finger to his lips. His eyes darted to the tavern across the alley. Eirikr did not mean to sound so cold that the boy took a step back. As the boy ran off down the dark alley between two merchants’ homes, Eirikr stood and watched him. He looked back at the tavern where Sten drank with his associates and then raised his hood back over his head and started back toward the nicer part of town. Eirikr stepped inside the Silver Reel and scanned the common room for the familiar face. Eruviel sat drinking at a table well to the side of the busy room and he made a beeline to the chair opposite her. He kept his hood up as he sat trusting in her instinct and Elvish senses to keep his back. Rolling her eyes, she pushes her drink toward him. “You have news. You best be ready to share when I return.” Eruviel stood and patted his shoulder as she passed him to go order another drink. Eirikr took up the mug and savored the house ale. He missed the bitterness of the pale lager Ditmar brewed and the cool finish revitalized him. When Eruviel returned, he looked up at her with sincerity. He shot a glance over his shoulder. “No. I don’t think it’s safe for me to do so. In fact, I should head for the woods now. I tomorrow night, I will meet you on the north side of the square…” he trailed off as he felt the hairs on the back of his neck stand on end. “Do what you will until then.” Before she could protest, he stood and strode away from the table. Sticking to the edges of the room, he made his way to the door and quickly ducked out into the street. He walked briskly to the east toward the bridges to the shores. The feeling of being watched did not fade as he ducked down shadowy shortcuts trying to lose the tail. It wasn’t until he crossed the bridge and neared the shadows of the trees did the sound of something whistling through the air warn him of the knife. He spun to the left and stooped to his knee as the blade whizzed past and struck the trunk of an evergreen. The thud of boots storming near alerted him of his charging attacker. Instead of rising to meet him, Eirikr stayed low feigning injury. As the man reached for his neck, Eirikr burst to his feet and knocked him off balance. As he fell, the attacker kicked out at Eirikr’s knee. He only just managed to dodge the impact, but the movement it took caused him, too, to fall in a heap on the grass. The moonlight flashed off the dagger pulled from a sheath beneath the man’s arm. Before he could get a grip on it, Eirikr slammed his fist into the man’s mouth. His knuckled bruised against teeth and in the back of his mind, he mused that they were probably torn. He rolled, dragging the man with him. The momentum caused them to tumble over one another until his attacker sucked in a cry; Eirikr pulled back and saw the knife in the man’s neck. The blood pulsed from the wound, pooling beneath the man’s head and soaking into the ground beneath him. Scrambling to his feet, Eirikr wiped his mouth with his swollen knuckles and looked down at the dying man. Choking on his own blood, the man possessed the audacity to laugh. Flecks of red flew out from between his lips and spotted his dirty shirt. “Y-yer wife s-says hullo,” the man managed to articulate before he started drowning on his own blood. Eirikr watched the blood slow to an ooze with each pulse of the cretin’s heart. He would not have the luxury of bleeding out quickly. No, it would be a slow death. Gritting his teeth, he reached down and pulled a third knife from the man’s belt. He had helped the passing of animals he hunted. He knew how to end suffering quickly and with mercy. His fingers flexed around the hilt of the knife and he slowly raised it as he stared down at it. It was long – more a dirk than a dagger. He turned it over and stared at the carving of a wagon wheel in the dark wood. The man looked as though he wanted to laugh again. Eirikr seized the front of his bloodied shirt and pulled him up. The man’s eyes started to glaze. The man went slack as he lost consciousness. A growl of frustration escaped Eirikr as he sunk the dirk into the man’s chest with both hands, sending him – and the answers to Eirikr’s questions – to the beyond. Ninim Tenorbekk knelt by the shore of Long Lake as she scrubbed out the week’s laundry in the fading twilight. Her lithe body moved awkwardly beneath its burden; her back ached and she was hungry. She had aged beneath the weight of her house guest. He took too much. Used too much. And after eight months of his attentions, gave too much as well. She wrung out the last of Sten’s shirts and hated the fact it was not her husband’s. As she tossed it into the basket, she cut off sob that threatened to escape her throat. No. She would not fall to pieces. She would not fall to pieces. She should not fall to pieces. Eirikr would return and together, they would end the time stolen from them. They would reclaim their lives, rid themselves of the parasite, and start new. Start fresh. Standing, she braced the basket of wet clothes against her hip and held on to it as best she could as she waddled toward the backyard where the drying line stretched between two trees. The sob threatened to loosen from her throat where it lay like a chicken bone, choking and painful. How could they start new with this…this thing growing inside her? The first time Sten pushed open her bedroom door, she thought it was a dream. Indeed, the entire evening seemed fragmented after they had eaten dinner. The bruises on her wrists the next morning and the scent of him on her bedsheets were the only signs that her memories were no mere dreams. When she started watching her food and drink, robbing Sten of the opportunity to drug her, it only led to a harsher waking world. He did not care when she fought back. In fact, he seemed to savor every slap he laid across her face until her head was swimming enough to staunch her resistance. She learned quickly to accept his attentions in order to protect herself from physical harm. Every night, her spirit suffered all the more. With the last shirt hung, Ninim gathered up the basket and headed for the house. She braced her hand beneath her bulging belly and hesitated at the back door. Closing her eyes, she felt the baby within her stir. It tried to stretch without much success. It was crowded in there. Her eyes still closed, she leaned her head against the rough door. Eight months he had been terrorizing her. Nine months since Eirkir had left for Bree. Her letter must have reached him. It had to have reached him. He had to be coming right now to silence her fears and to love her again. He would love her, no matter what. Holding this in her heart, she shifted the basket around her pregnant belly and lifted the latch to face her life.